Officers shot the man, who also had a knife, when he refused to drop a fake gun that he pointed at them, police said. EASTCHESTER — The fatal police shooting of a knife-wielding man who pointed a fake gun at them during an hours-long standoff was captured on cameras worn by four officers Wednesday, the first time such an incident has been captured on the devices, NYPD officials said. 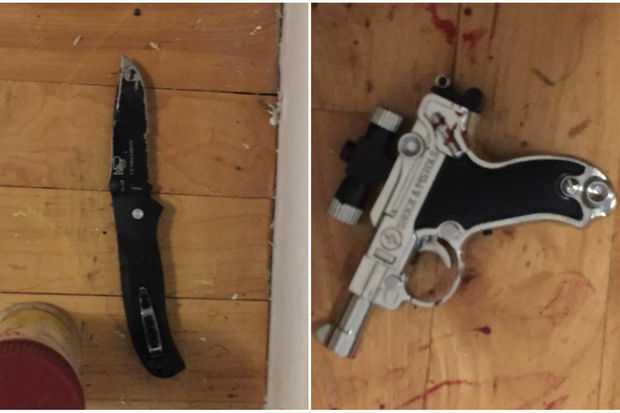 The officers had been called to 3700 Pratt Ave., near Conner Street, minutes after 4 p.m. to check on a tenant there, but he confronted them with weapons when the building's landlord used a screwdriver to open the door to the third-floor studio apartment, according to the landlord and NYPD Chief of Department Carlos Gomez. The tenant, 31-year-old Miguel Richards, refused to drop the black folding knife in his left hand and hid his right behind his back, police said. "They were trying to talk to him. He wasn't answering us. He was standing in the corner. He had dark glasses on. You couldn't see his eyes. You could see a knife," said landlord Glenmore Carey, 67. "They kept telling him, 'We're not here to hurt you.' They were saying, 'Put it down, put it down.' They were begging him. But you couldn't see the other hand. He was saying nothing," Carey added. The officers were gradually got more stern, Carey said. "Put it down. Put it down. Put it down," the officers said, according to the landlord. "Whatever you have in your right hand, put that down. We can't see your right hand," they continued. Officers then spotted what appeared to be a silver handgun in Richards' right hand and asked him if it was real, police said. It wasn't immediately clear if Richards responded, but he refused to drop it when they ordered him to, police said. Officers said they didn't want to hurt Richards, but he then pointed the handgun — which turned out to be an imitation firearm — at them, prompting two officers to open fire and a third to use a stun gun, police said. Richards was pronounced dead at the scene, police said. His family was devastated by the incident. "He was a good person. That's all I can say," said the man's weeping father, Belvett Richards, 61. "He was murdered in cold blood. He did not deserve to die this way." Richards, who's originally from Jamaica, had lived in the $175-per-month studio for a couple months and was studying information technology at a nearby school, family said. Neighbors said he liked to listen to loud reggae, but rarely interacted with them. His landlord grew concerned when he realized he hadn't spoken to Richards in more than a month. "When I knocked, he wasn't answering. I hadn't seen him. I was concerned and said let me check on him. I went to the [police] station and said, 'In a case like this, what can I do?' They said, 'You can ask for a wellness check," Carey said. He asked for a wellness check and he and responding officers then opened Richards' apartment, he and police said. Four of the officers were wearing body cameras that recorded the deadly encounter, the first time any such incident has been captured by the devices, according to The New York Times. The cameras were first used by NYPD officers in the 34th Precinct in April. The NYPD's commissioner will confer with the Bronx District Attorney to determine if they'll release the footage of Wednesday afternoon's shooting to the public, Gomez said.